Today’s telecommunications companies have access to a huge wealth of consumer and personal information. When used appropriately, this data help analysts and data scientists optimize marketing campaigns, perform advanced network analysis and forecast handset demand. If taken a step further, this data can be anonymized and enriched to the point where the entire customer data store can be monetized for further downstream benefits. 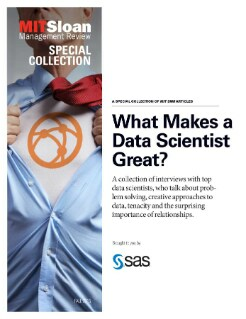 In this special collection of interviews sponsored by SAS, discussions with top data scientists from General Mills, Kaggle Inc. and the director of the MIT Sloan Center for Information Systems Research focus on analytic problem solving, creative approaches to data, tenacity and the importance of relationships.